Hundreds of protesters have gathered outside the European Council building in Brussels on Friday to voice growing disapproval of TAFTA, a proposed Transatlantic Free Trade Area between the EU and the US, and to demand changes at the EU institutions. 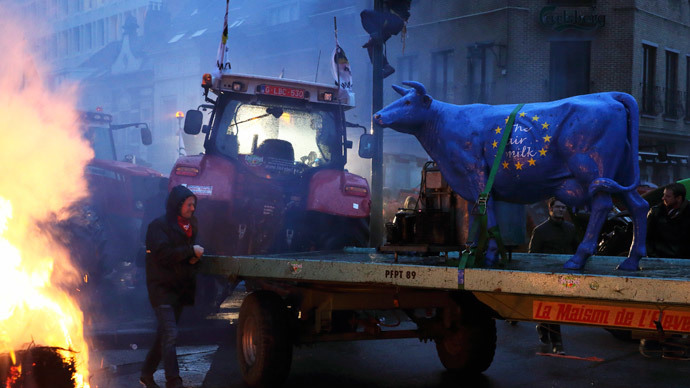 The rainy streets of Brussels have been filled with hundreds of protesters, with security in the city stepped up since morning and police officers in helmets and shields ready to respond in case violence breaks out. The action was expected to draw protesters from France and Germany. Those protesting against TAFTA, also known as the Transatlantic Trade and Investment Partnership (TTIP), worry that the new treaty will bring a large influx of GMO products, such as hormone-treated beef and genetically-modified corn, from the US to Europe. A public campaign against the upcoming TAFTA deal between the US and Europe has been launched earlier this year. In 2013 France said it wouldn’t sign the TTIP as long as the US continued spying on EU allies. In November this year, a report stated that France, UK and Germany will block the trade deal all together if the mechanism of investor-to-state dispute settlement (ISDS) is included. Protesters have demonstrated against TAFTA across Europe. The controversial pact is destined to bring down regulatory barriers. Proponents of the deal say it will boost GDP in the EU by €100 billion (US$123 billion) and in the US by more than $100 billion, as well as create over 700,000 jobs in America. More free trade would increase investment, and widening export industries would add jobs. Opponents of TTIP warn that these figures are not realistic and that cheaper goods and services would hurt the EU and help the US. Boosting trade with the US may also come at a cost for European countries that may need to compromise on health, safety and environmental regulations.